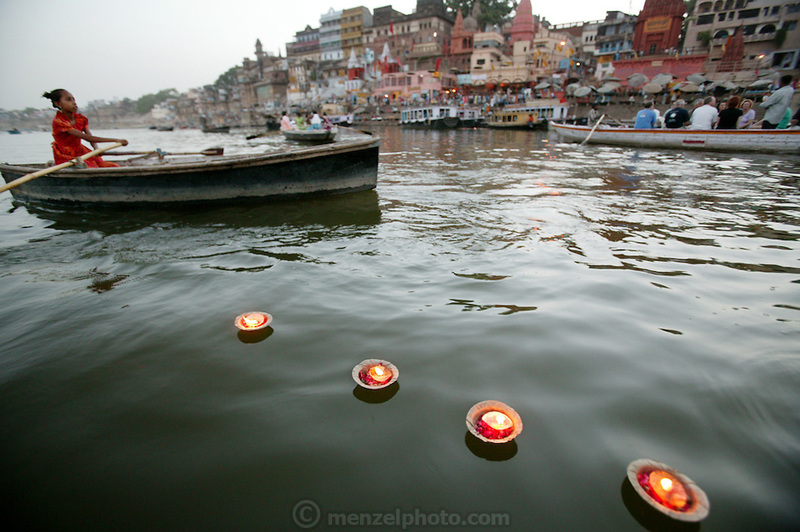 A young girl in a rowboad sells floating votive candles to mourners and tourists near the Dashashwamedh Ghat, on the Ganges River in Varanasi, India. The most visited ghat of Varanasi by religious pilgrims, Dashashwamedh ghat is the most beautiful ghat in the city. The ghat is close to the famous 'Vishwanath Temple' and is therefore of high religious importance. The most enticing part is the evening 'Puja' performed by the group of priests. Also known as the 'Fire Puja', the ceremony is a dedication to River Ganges, Sun, Lord Shiva, Fire and the whole universe. The Ghats finds mention in the old religious texts, as it is said that lord Brahma created the ghats to welcome lord Shiva.